How many more will God kill? The book of Joshua can be summed up with the following words: "So Joshua ... utterly destroyed all that breathed, as the Lord God of Israel commanded." 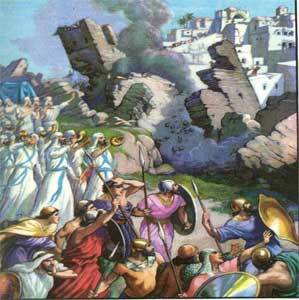 (10:40) He did it to Jericho, Ai, Makkedah, Linah, Lachish, Gever, Eglon, Hebron, Debir, and 20 other cities. And he did it under God's command. And God wasn't just an innocent bystander either. He was an active combatant. "The Lord God fought for Israel." 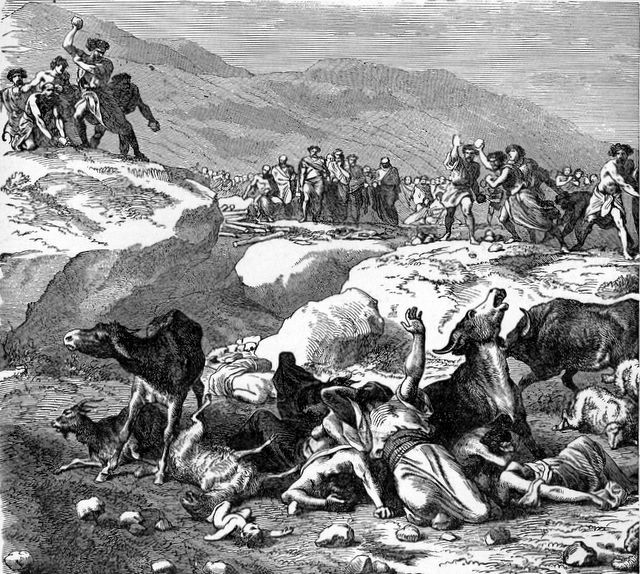 (10:42) God slew them with a great slaughter and even "chased them along the way." Sometimes he "threw down great stones from heaven," and once he even stopped the sun from moving so that he and Joshua could get all their killing done in the daylight. 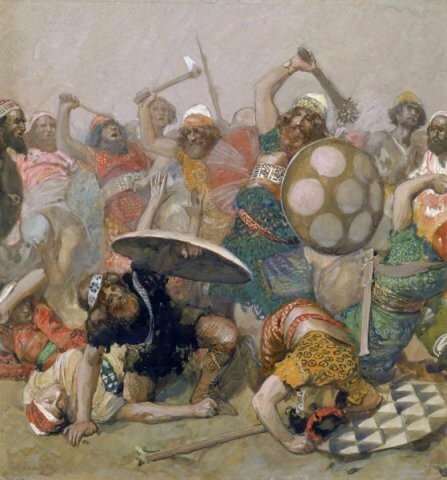 There are a couple other killings in Joshua that deserve mention: A family is burned and stoned to death (along with their animals) to punish the father for taking "the accursed thing", five kings are killed and hung on trees. Here is a list of the killings in Joshua. 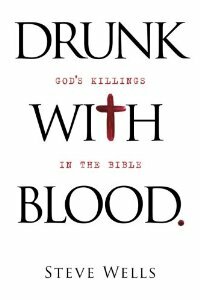 Jericho is one of God's more famous killings. And believers seem to like it a lot. They sing songs about it, and tell their children about it. God tells Joshua that he has given the city of Jericho into his hands and that he and his men should march around the city every day for six days with seven priests marching before the ark blowing seven trumpets made of rams' horns. On the seventh day the seven priests will march around seven times blowing their seven trumpets. They'll make a long blast, everyone will yell, and the walls will fall down. So the trumpets sounded and the people yelled and the walls came tumbling down. Then Joshua told the soldiers to kill everyone in the city as an offering to God, except for the prostitute, Rahab, and her family. But all the silver, gold, bronze, and iron belonged to God alone. So the soldiers went into the city and killed everything in it. Men, women, young, old, cattle, sheep, and donkeys. But they spared Rahab and her family. Then they burned everything in the city, except for the gold, silver, iron, and bronze, which they put into God's treasury. After destroying Jericho, Joshua said that whoever rebuilt the city would be cursed by God and be forced to sacrifice his oldest and youngest sons. The story begins with Joshua sending spies to the land of Ai. The spies return saying Ai would be easy to conquer, r equiring only a few thousand men. So Joshua sent 3,000 soldiers, but they were defeated by the men of Ai, who killed about 36 of them. When Joshua heard what had happened, he tore his clothes, fell on his face, and put dirt on his head, thereby proving that he was a real Bible character. He then asked God why they were defeated. God told Joshua to get up off his face. And then God said that the Israelites were defeated by Ai because someone took an accursed thing during the Jericho Massacre. God told Joshua what he needed to do to get back to successful genocide: burn to death the man with the accursed thing, along with his family. God even pointed out the guy. His name was Achan. So Joshua ordered Achan to confess. Joshua then rounded up Achan, his family, his livestock, and all their possessions. "And all Israel stoned them with stones and burned them with fire, after they had stoned them with stones." And that made God less angry. After stoning and burning to death Achan and his family (34), Joshua was back in the genocide business. God told Joshua to do unto Ai as they did unto Jericho, except that this time the Israelites could keep some of the loot for themselves (instead of giving it all to him). So that's what they did. killed the King of Ai, and hung his dead body on a tree. Just like God told them to do. And, finally, after they were done killing all the people, Joshua killed some animals as a "peace offering" to his bloody god of war. One thing I really like about this story (What's not to like?) is that this time I don't have to guess the number of victims. The Bible tells us how many were killed: 12,000. 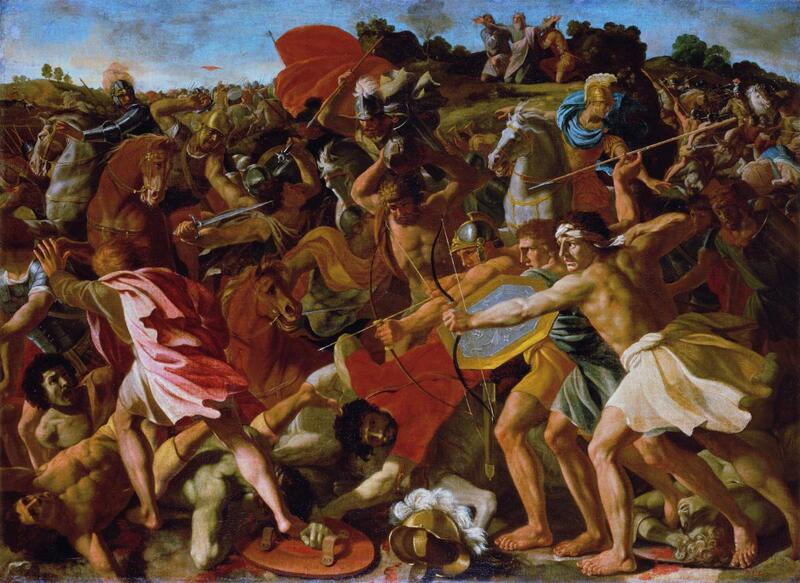 Joshua and the Israelites slaughtered or enslaved the people from every city that they came across. They killed everyone in Jericho (33) and Ai (35) and enslaved the people of Gibeon (Joshua 9.21-27). So the neighboring cities were getting kind of nervous. Five kings from these cities (the Amorite coalition) decided to attack the Israelites. Then God gets involved. God tells Joshua not to worry; he has given the Amorites into Joshua's hand, and the Amorites would just run away when they were attacked. So Joshua attacked, but it was God who did most of the dirty work. He "discomfited them" and even "chased them along the way." But God was just getting started. He threw down from heaven giant hailstones and killed even more Amorite soldiers than the Israelite army. So in this killing, God got directly involved. He slaughtered people, "chased them along the way," cast down huge hailstones from heaven, and, at Joshua's request, he stopped the sun from moving for 24 hours. You just can't ask much more from a God than that. Here's how the Bible puts it. In his last killing, God got right in there and "fought for Israel." He "discomfited them ... and slew them with a great slaughter ... and chased them along the way." 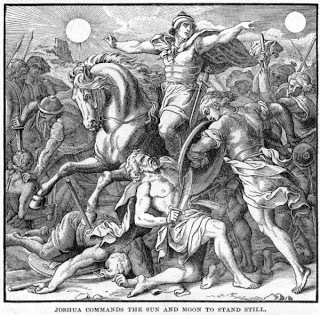 He "cast down great stones from heaven" and made the sun (and moon) stand still still so that Joshua could get his killing done in the broad daylight. God hadn't been so busy since he made all the stars in a single day. But while God was busy chasing people, throwing stones, and stopping the sun and the moon from moving, the five kings got away. When the Israelites found them, Joshua told them to roll some big stones over the mouth of the cave to trap them, and then chase and kill any of the Amorite soldiers that were trying to get away. 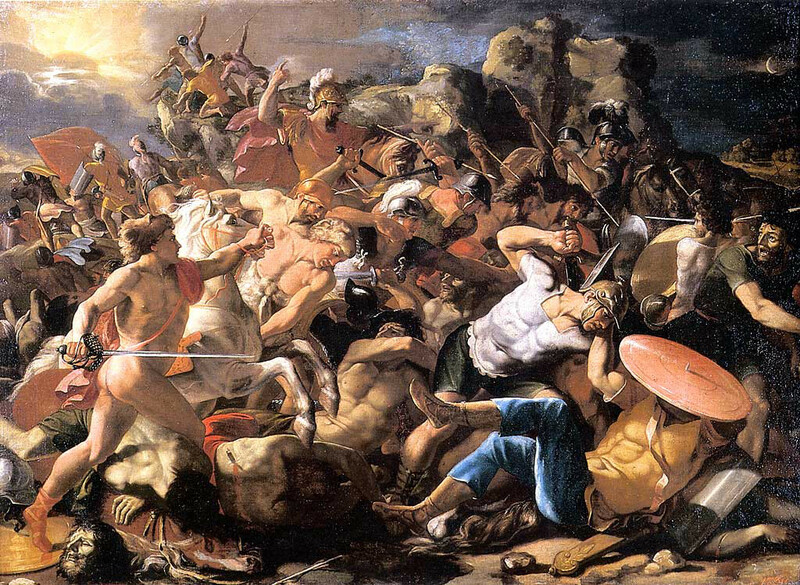 He told them to "smite the hindmost of them" (kick their butts). Pursue after your enemies, and smite the hindmost of them; suffer them not to enter into their cities: for the LORD your God hath delivered them into your hand. 10.19 So that's what they did. Then they opened up the cave and brought the five kings to Joshua. He and his captains then do something strange: they put their feet on the necks of the kings. So I guess God does this to his enemies, too. After Joshua withdraws his feet from the kings' necks, he does what he does best: he kills them. And hangs their dead bodies on trees until evening. Then he took down their bodies, put them back in the cave that they were hiding in, and covered the entrance to the cave with a bunch of rocks. The rocks are still there to this day. No kidding. The title pretty much says it all on this one. It's kind of boring reading though. The same thing happens in the same way seven times, all in about a dozen verses or so. So God delivered seven kingdoms and Joshua killed everyone in each kingdom "with the edge of the sword." And you can't blame it all on Joshua, either. He was just following orders, destroying everything that breathed, "as the Lord God of Israel commanded." In God's last killing, everyone in seven cities was massacred, along with the kings, with the land taken by the Israelites. When King Jabin of Hazor heard about it, he sent a letter to all the surrounding kingdoms (those that hadn't yet been slaughtered by the Israelites) to form a coalition to defend against the Israelites. And it worked, too. 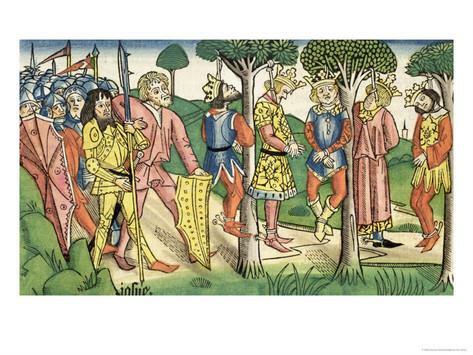 All the kings (around 20 or so) joined the coalition, forming an army with more soldiers than the grains of sand on all the ocean's beaches. But God told Joshua not to be afraid because tomorrow he would kill them all and deliver their dead bodies to Joshua. God told Joshua to hamstring ("hough" in the KJV) their horses and burn their chariots. The Israelites killed the King Jabin of Hazor and his people until "there was not any left to breathe." Then they did the same to all of the other kings and cities in King Jabin's coalition. Joshua, of course, killed all the kings. But the most disgusting thing about this whole bloody, genocidal affair is that it was completely unnecessary. 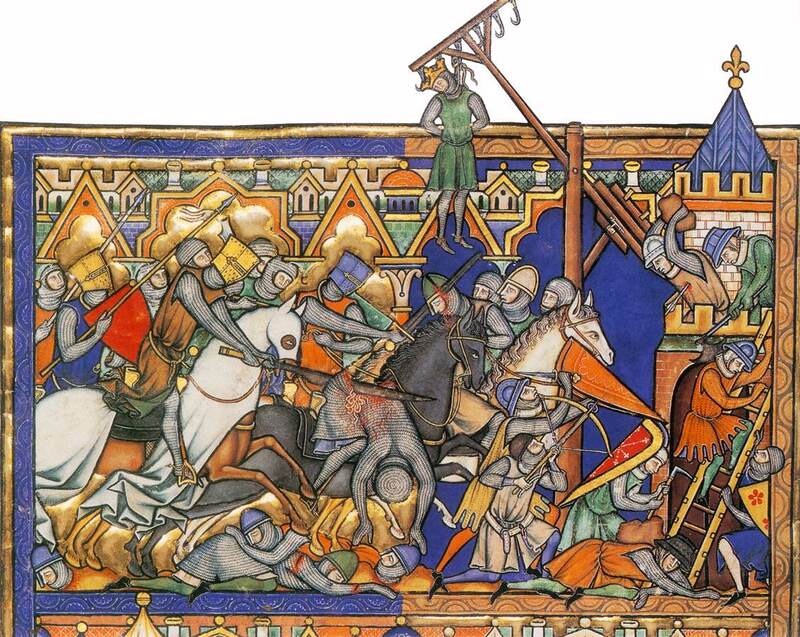 God purposefully hardened the kings' hearts so that he would have an excuse to kill them, along with all the men, women, children, and babies in their kingdoms. We've finally made it to the last of God's killings in Joshua. And although this one is pretty unspectacular, t does involve some giant killing. If you remember back in killing 30, God killed everyone in the "land of the giants." Here he helps Joshua do it again. The victims were the Anakim, who are described elsewhere in the Bible (Dt 1:28, 2:10, 2:21, and 9:2) as "a people great and tall" -- which is biblespeak for "giants". Since Joshua utterly destroyed all their cities and no Anakim were left alive, I estimated the number of victims to be 5000.